The art of the bassoon as a concerto instrument is often overlooked but the material provided here should definitely call for extra scrutiny on the hidden potentials of the instrument. Mozart's fabled Concerto (also better known for its oboe alternative), is perhaps the most famous work and it is played here with extra geniality and authority by Laurence Perkins and the admirable Manchester Camerata. 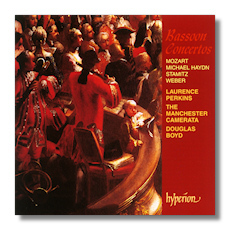 The combination also brings an earthiness and effusive beauty to the charming Michael Haydn Concertino whilst Stamitz's Concerto is also imparted with an irresistible drive and character. Weber's two works, the 'Andante e Rondo Ungarese' and the Concerto in F Major are both representative of the bassoon's tonal capabilities and they receive top-notch performances here. You could not fail to find severe enjoyment from this disc, which is beautifully recorded and as usual with Hyperion, lavishly presented. Perkins and the Manchester Camerata make ideal partners and the end product is indeed a joy to listen to.